British automaker Morgan recently announced that it will be bringing back its four-wheel models to the United States after 10 years of absence. It will be sold through Morgan’s official US distributor, Isis Imports, according to TopSpeed. Morgan was previously only allowed to sell the three-wheeler model in the US, but Isis (thanks to a new law) now will be able to import the more traditional four-wheeled models. The British carmaker did not reveal what particular models will be ushered along the US coastline, but they would probably bring cars from the Classic lineup such as the 4/4, Plus 4, Roadster and Plus 8. In a statement, Isis Imports said details are still being finalized although it looks like Morgan will start receiving orders for the four-wheeled models this summer. The statement added that US spec cars would start to be produced before the year ends. 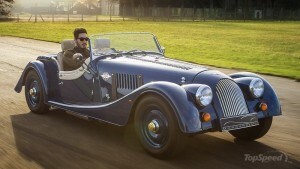 Though pricing information is not yet available, the US-spec, four-wheeled Morgans will expectedly be a bit more expensive than their British-market counterparts. The most likely model to first arrive is the Roadster, which uses a 3.7-liter V-6 rated at 280 horsepower and 280 pound-feet of torque. Weighing only 2,094 pounds, the Roadster hits 62 mph from a standing start in only 5.5 seconds and tops out at 140 mph. This is certainly a welcome news for US-based retro car lovers who keep on bugging the Morgan company to bring the cars back to US shores. The need for retro UK-made vehicles was high among Americans. Morgan’s return to the US will mark the comeback of the only auto company that still based its models on the classic recipe. Although we won’t be seeing a full lineup of Morgan cars, one or two is more than what the US is expecting to have in its market.